My book on Karl Barth’s Christology has been in print for a little over a year now, though the price tag has put it out of reach for the ordinary theologian on a budget. But, thanks to the wonders of the paperback, that’s all about to change. The paperback edition of Karl Barth and the Incarnation will arrive at the end of this month! So if you have interests in Christology, the history of doctrine, or Barth’s theology, I hope you will give the book a look. Amazon currently has the book listed at a pre-order price of $29.95. Preview the book there. This work demonstrates the significance of Karl Barth’s Christology by examining it in the context of his orientation toward the classical tradition – an orientation that was both critical and sympathetic. To compare this Christology with the doctrine’s history, Sumner suggests first that the Chalcedonian portrait of the incarnation is conceptually vulnerable at a number of points. By recasting the doctrine in actualist terms – the history of Jesus’ lived existence as God’s fulfillment of His covenant with creatures, rather than a metaphysical uniting of natures – Barth is able to move beyond problems inherent in the tradition. Despite a number of formal and material differences, however, Barth’s position coheres with the intent of the ancient councils and ought to be judged as orthodox. Barth’s great contribution to Christology is in the unapologetic affirmation of ‘the humanity of God’. This selection turns up late in Chapter 2, which traces Barth’s engagement with so-called “Logos Christology.” In his lectures on John’s gospel (published as Witness to the Word, and repurposed in a key section of CD II/2) Barth famously identified the concept of the Logos as a “placeholder” (locum tenens) — not a person in its own right but John the Evangelist’s way of clearing space for none other than Jesus himself. That the Logos concept is but a placeholder that is filled in and given meaning by the history of Jesus Christ is the single greatest insight from Barth’s 1925 lectures on the Johannine prologue, and he maintains this view throughout his life. This began as a simple exegetical decision: John wishes his readers to see Jesus as the true identity of the one who was with God in the beginning, and who was (and is) vere Deus. He does not mean for readers to conclude that the prior and therefore more authentic identity of this person, whose life he is narrating, is actually the Logos of God – as if Jesus Christ was a mere alter-ego assumed for the economy of salvation. Jesus is basic; ‘Logos’ is a cipher. What emerged from the young Barth’s exegesis would, by 1940, become a full-fledged principle of his dogmatic theology. “Jesus Christ is the content and form of the first and eternal Word of God.” It is Jesus Christ – “not an empty Logos, but Jesus Christ the incarnate Word, the baby born in Bethlehem, the man put to death at Golgotha and raised again in the garden of Joseph of Arimathea, the man whose history this is” (CD IV/1, p. 53) – who is the unity of Gospel and Law, the gracious address of God and the gracious claim of God. He is both of these at one and the same time, and by virtue of this unity it is Jesus in all his history who is “the pre-existent Deus pro nobis” (ibid). If the Logos is a placeholder concept, the corollary to this is that Jesus Christ is not so. He is not a mere principle or economic phenomenon, but the one for whom the concept clears space. He may not be defined strictly as the predicate of another, more basic subject – i.e., as the role played by the Word on the stage of history, or the identity given to Him only after He has been born of the Virgin Mary. “Jesus Christ is attested to us by the Old and New Testaments in such a way that we are in fact deprived of the possibility of speaking of a further postulate instead of Him,” Barth says. “Jesus Christ is attested to us in such a way that we can say of Him either nothing at all, or, wholly unequivocally, that He is the Lord” (CD II/1, p. 150). It is necessary to speak of Jesus as the most basic identity of God the Son – and therefore as the subject of eternal election – because of the gospel witness. “He, Jesus Christ, is the free grace of God as not content simply to remain identical with the inward and eternal being of God, but operating ad extra in the ways and works of God.” For this reason, Barth concludes, “before Him and above Him and beside Him and apart from Him there is no election, no beginning, no decree, no Word of God” (CD II/2, p. 95). For Barth, this provocative statement requires no further qualification. Jesus is not the name given to the Son qua human but is himself the second person of the Trinity. As a further development upon Barth’s Münster Christology, the name ‘Son’ speaks to the relation; ‘Word’ to the notional concept; and ‘Jesus’ to the living person who is described by both of these. And so Jesus Christ is both the Logos asarkos and ensarkos, the free grace of God in movement toward creatures. But because he has eternally assumed a human existence, theology can no longer speak of a Logos asarkos as a concrete possibility – and certainly not as an independent being. In effect the extra Calvinisticum has been reversed (as least on a logical register), so that the Logos is a concept that has meaning only within the larger reality of Jesus Christ. 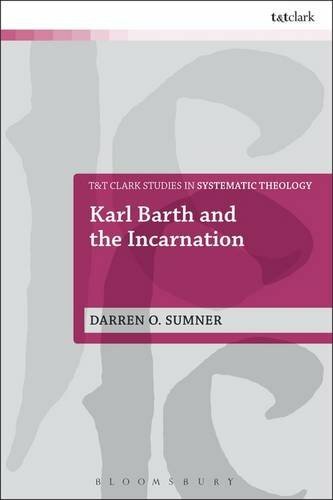 Karl Barth and the Incarnation is now available from T&T Clark. The revised version of my dissertation will be available in November (look for it at the T&T Clark booth at the AAR/SBL meeting in San Diego), though the publisher is now taking orders for the digital edition. They have also slashed the price in anticipation of the release — now on sale for a mere $78 for the hardback edition. In this first-rate study of Barth’s Christology, Darren Sumner argues convincingly that Barth stands in continuity with the intent and direction of the orthodox Christological tradition, but at the same time transposes it from a static to a dynamic form more faithful to the scriptural witness to the living God who freely determines to be God with and for us in Jesus Christ. The material focus of the volume is on what Sumner calls the ‘scarlet thread’ that runs through the Church Dogmatics: that from all eternity God has chosen to include the humanity assumed by his Word as integral to his divine identity and that misuse of the doctrine of logos asarkos subverts this truth. Sumner’s bold defence of this claim and his analysis of the disputed issues related to it, such as divine immutability and impassibility, make this volume a solid contribution to Barth studies. In this carefully argued book, Darren Sumner advances our understanding of Barth’s Christology. He discusses Barth’s later work in Church Dogmatics only in the light of his earlier writings. He delves into important topics like Logos Christology, kenosis, the extra calvinisticum, and divine impassibility. This is definitely a book to be reckoned with, not only by those who will agree with it, but also by those who may see things somewhat differently. The argument is fair-minded throughout. Historically informed, interpretatively judicious, and systematically discriminating, Karl Barth and the Incarnation is a terrific contribution to Barth studies. Those seeking to understand Barth’s complex relationship to his forebears and those looking to appreciate the innovative christological perspective of the Dogmatics will profit greatly from Sumner’s elegant and suggestive work. Several of the papers from January’s second annual Los Angeles Theology Conference are headed to print, with Zondervan prepping the volume Advancing Trinitarian Theology: Explorations in Constructive Dogmatics. As with last year’s conference volume , Oliver D. Crisp and Fred Sanders serve as editors. Nine essays on the doctrine of the Trinity are included, among them those of conference headliners Lewis Ayers, Karen Kilby, Stephen R. Holmes, Thomas H. McCall, and Sanders. … What is therefore remarkable and “offensive” about Barth’s words is that he does not restrict this relation to the economy, but suggests that the superiority and subordination (Vor- und Nachordnung) “belongs to the inner life of God.” Furthermore, Barth has made this claim in the context of an explicit disavowal of the ancient heresy of Subordinationism (Subordinationismus), which taught that the Son is ontologically inferior to the Father. This view was offered by pro-Arian theologians because it allowed them more easily to resolve a certain set of difficulties – namely the strict singularity and immutability of God in light of the human life and death of one who is confessed to be God’s Son. It was rightly rejected by the church. The language of subordination, then, bears a great deal of unfortunate baggage in Christian theology. Can theologians have it both ways – some sort of subordination in the Trinity without heretical Subordinationism? The question of whether Christian theology rightly may speak of a strictly functional subordination in the Trinity certainly extends beyond Barth studies. This qualifier has recently generated a great deal of controversy in evangelical quarters. That debate concerns whether “eternal, functional subordination” in the Trinity ought to inform our understanding of human gender relations, and is only tangentially related to my task here. What I wish to do is to identify the place that Barth’s account of divine obedience has in his trinitarian theology, and whether it is fitting to describe it using the language of “functional” and “ontological” subordination – terms that belong to the contemporary conversation, and which to my knowledge were never employed by Barth. To do this I will subject Barth’s position to three lines of criticism: (1) Can Barth affirm that this subordination is eternal, yet still restrict it to function and so avoid the trap of heretical Subordinationism? (2) If Barth’s theological ontology bears an actualist character, can he affirm that the subordination of the Son to the Father is strictly functional and not also ontological – since God’s being and God’s activity are always mutually implicated? (3) Does Barth’s location of obedience within the inner life of God not imply two divine wills, and therefore necessarily a social model of the Trinity? Pre-order the book now at Amazon for only $17, or get the Kindle version for $12. The third L.A. Theology Conference will take place at Biola University January 15-16, 2015, on the topic “Locating Atonement.” Read more at the conference website. Rowan Williams, “Barth on the triune God,” in Mike Higton (ed. ), Wrestling with Angels: Conversations in Modern Theology (Grand Rapids: Eerdmans, 2007), p. 129. Kevin Giles, “Barth and Subordinationism,” Scottish Journal of Theology 64 no. 3 (2011), p. 346. Paul D. Molnar, “The Obedience of the Son in the Theology of Karl Barth and of Thomas F. Torrance,” Scottish Journal of Theology 67 no. 1 (2014), pp. 50-69 (quotation on p. 59). My review of Edward T. Oakes’ new introduction to Christology — Infinity Dwindled to Infancy — has just been published in the new issue of the International Journal of Systematic Theology (vol. 16 no. 2). This is a very strong survey with few if any oversights, and I definitely commend it for those who are new to this area of Christian theology. It’s also very well-suited for classroom use, particularly at Catholic and ecumenically-minded institutions. Throughout Oakes quotes copiously from secondary sources, particularly those he favors (including Hans Urs von Balthasar). This is usually welcome in the main body, or relegated to extended footnotes, but adds to the sense that the book seeks to be a classroom text – more a compendium of historical and contemporary scholarship – and not at all original. The overall accessibility and thoroughness of the book commend it well for classroom use. A pair of appendices offer short summaries of the ecumenical councils and a glossary of terms. More complex material is included in the volume, but wisely shunted into excurses (the extra Calvinisticum, for example, as well as the distinction of will and intellect in Maximus’ dyothelitism). Both undergraduate and graduate-level students will thus benefit from Oakes’ treatment. Particularly in the earlier chapters it seems as though no stone has been left unturned, no detail left out for the sake of brevity. Look for the full piece in the April issue of IJST. T&T Clark has added to their website the official listing for my forthcoming book Karl Barth and the Incarnation: Christology and the Humility of God. I stumbled across the listing last week while looking up another book in the Studies in Systematic Theology series, and was surprised to see that the book has made it up and already has a shiny purple cover. Only the eBook formats are listed so far, but rest assured … there will be a hardback, too. I was surprised only because the manuscript isn’t actually in yet. It’s due to T&T at the end of this week, and I’ve been burning the midnight oil to complete the final revisions. It will be on time (knock on wood) and hopefully arrive on or around the publisher’s anticipated September release date. So please, if this is a topic that interests you, be a mensch and look for it at AAR or ask your library to acquire it. This is a revised version of my PhD dissertation at the University of Aberdeen (2012). It’s been a little strange to revisit this work after a full year away from it. It was pretty much my life for 36 intense months. Of course books are “never completed, only abandoned,” but I am very grateful to have the opportunity to revisit the project and (I hope) make some improvements. The basic case of the book is that the merits of Karl Barth’s Christology may be seen in sharpest relief when contrasted with certain conceptual limitations in the Christology (or Christologies) of the classical tradition. Chapter 1 lays the groundwork by narrating that history and identifying four problematic areas for the church’s doctrine of the person of Jesus Christ: his identity with the pre-existent Word, divine immutability, kenosis, and divine impassibility. In the second chapter I examine Barth’s regard for the Christology of the ancient church and the Reformation, tracing its development from Barth’s lectures in Gottingen to CD IV. If the first chapter provides context and the second chapter does the ground-clearing, Chapter 3 lays out Barth’s positive presentation of the doctrine of Christ. The focus is on CD II/1-2 and CD IV/1-2, taking up four pairs of themes that best display what Barth is up to in his actualist Christology: election and covenant, time and eternity, the communication of natures, and the status duplex. The final chapter contains the real pay-off, as I line up the four critical issues outlined in Chapter 1 and discuss how Barth’s Christology offers resources for thinking through and beyond them — while yet remaining faithful to the orthodox tradition. I was privileged to be able to participate in the most recent conference at the University of St Andrews on Scripture and theology, sponsored by the Institute for Bible, Theology, and Hermeneutics. This event, held in July 2012, engaged the epistle to the Galatians. These conferences take place every three years, with the proceedings published in a volume of collected essays. Past installments have included Genesis, Hebrews, and the Gospel of John. The details and cover image for the conference volume Galatians and Christian Theology are available now, and you can head over to Amazon to pre-order the book. Mark Elliot, Scott Hafemann, N.T. Wright, and John Frederick serve as editors. The marquee contributors include John Barclay, Beverly Gaventa, Richard Hays, Bruce McCormack, and Oliver O’Donovan — but you can also find essays from a number of short paper contributors, including myself. My essay is titled “Karl Barth and ‘the Fullness of Time’: Eternity and Divine Intent in the Epistle to the Galatians,” and covers pretty much what the title says. In the essay I take Galatians 4:4f as a starting point, and run through Barth’s notion of eternity on the way to an account of the incarnation as God’s gracious manner of relating to creatures in both God’s time and given, creaturely time. Baker Academic has taken over publishing from Eerdmans. Amazon lists July 15, 2014, as the official release date.